Following the Staffordshire Surge's 14 - 8 victory over the Birmingham Bulls today, we have officially secured the #1 seed for the entirety of our NFC 2 play-off run. With both of the NFC 2 South teams getting a win away from home against one another in their two-game regular season series we jump from #2 to #1 by virtue of having the only remaining perfect record in the NFC 2, whilst the Bulls fall all the way to #4 with the Surge leap-frogging them into #3. With seeds 1 through 6 confirmed and locked in (assuming Chester win (vs Morecambe Bay Storm)), it'll be the #3 Staffordshire Surge who host our division rivals the #6 Dumfries Hunters in two weeks time, and the #5 Halton Spartans who travel to the #4 Birmingham Bulls. Crewe will fall out of contention all together should the Bombers win in their final game of the season (against Knottingley who are last in the division) they'd fall to fourth in the division by virtue of head to head record within the division. This means that ourselves and the #2 Chester Romans must await next week's fixtures to see who we get. The #10 Clyde Valley Blackhawks need a miracle, requiring both the Bombers and Phantoms to lose against the Knottingley Raiders and the Carlisle Sentinels respectively, both of whom are bottom of their divisions. Most likely for us (assuming both the Furness and Lincolnshire games go with form), are the Furness Phantoms - unless they concede 59 more than Lincolnshire do (in their respective wins next week) in which case we'd have Lincolnshire and Furness would go to Chester. Now we told you it wouldn't be easy to understand didn't we? 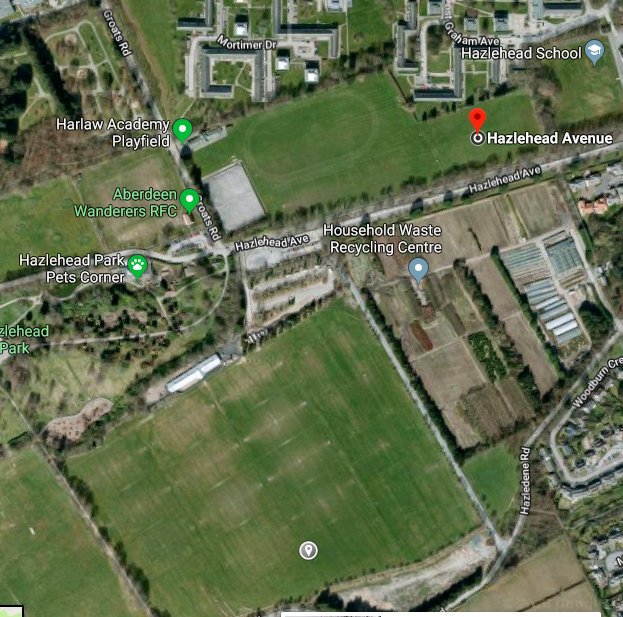 With an event running down at The Rig, it would be a home away from home - Harlaw Academy's Playing Fields - that would be the scene for a huge clash at the top of the Division 2 North table as we took on the Dumfries Hunters. Keen to avenge our 26-20 win at the David Keswick Athletics Centre in Dumfries, it was the Hunters who took the opening kick-off on a beautiful sunny day. MVP from our last game against the Clyde Valley Blackhawks, Rhys Elmslie would pick up where he left off in the kick return game, setting up excellent field position for the offence who would capitalise almost immediately. An opening drive connection between brothers Sean (WR #1) and Chris (QB #16) Breen would again find the endzone with the latter standing bravely in the pocket to put the ball on a plate for the former to open the scoring early doors; Roughnecks 7, Hunters 0. A field goal miss would squander some points in the first quarter, but WR #2 Chris "Jesus" Martin wouldn't let Roughnecks heads drop, taking the ball about 80 yards on a short screen pass to double the advantage. Not a bad way to score your first ever Touchdown; Roughnecks 14, Hunters 0. All was going well, until a fumbled punt snap would allow the Hunters back into the game as they seized upon the opportunity. With short field the Hunters would find the endzone themselves to bring them back within a score as quarterback found receiver. Electing to go for 2, the Roughnecks D would smother the play before it got going, tackling the escaping "kicker" for a loss of yardage. Immediately however the Hunters learned again the danger of the Roughnecks kick return - a unit which is emerging as a real asset to the team - as #22 Gamu Mukuredzi would take the ball all the way back to the Hunters' own redzone, before a horse collar tackle would move the ball further into the danger zone. A short series later, and some excellent play calling and execution, TE #85 Rob Hayes was wide open in the back endzone and QB Chris Breen would duly oblige, hitting him with a delicate pass for his first Touchdown of the year; Roughnecks 21, Hunters 6. Having staged a good comeback attempt in our first meeting of the season, the Hunters would look to do the same in the second half of this one, and they got off to a good start, scoring a touchdown on their second drive of the half, and their second drive of the game where a turnover would provide them with short field. Aiming to make it a 7 point game, the Hunters elected to go for two again, this time finding the endzone on a QB run emulating his running back on the previous play; Roughnecks 21, Hunters 14. That would be it for the Hunters scoring however, as the Roughnecks defence would stifle them for the rest of the game, allowing no more than a couple of first downs on any ensuing drives. It was a Hunters punt which would lead to the Roughnecks pulling out further in front too, as the defence held strong. #22 Gamu Mukuredzi would get another chance to return the ball and he didn't need to be asked twice. Collecting the ball just inside his own half, Gamu would twist and turn his way to the 10, shedding a tackle or two on his way, before powering his way over the line, dragging two defenders with him; 28 - 14, and the Roughnecks' first ever return touchdown. Of course, the spirited Dumfries side would never give up, but the only remaining score would be the Roughnecks as the game was put to bed. #18 WR Rhys Elmslie got in on the scoring act, collecting a deep pass from Chris Breen to make it four passing touchdowns through the air and cement the victory. We'd like to thank the Dumfries Hunters for making the trip north, and wish them well with the rest of their season. Our next game comes in a fortnight's time, as the West Coast Trojans travel to The Rig on the 8th of July. We hope you'll be there to see us take on the Trojans in a game where a win would seal the division crown with two games to spare. The Trojans are still looking for their first win of the season, and would be more than happy to spoil the party should we let them. 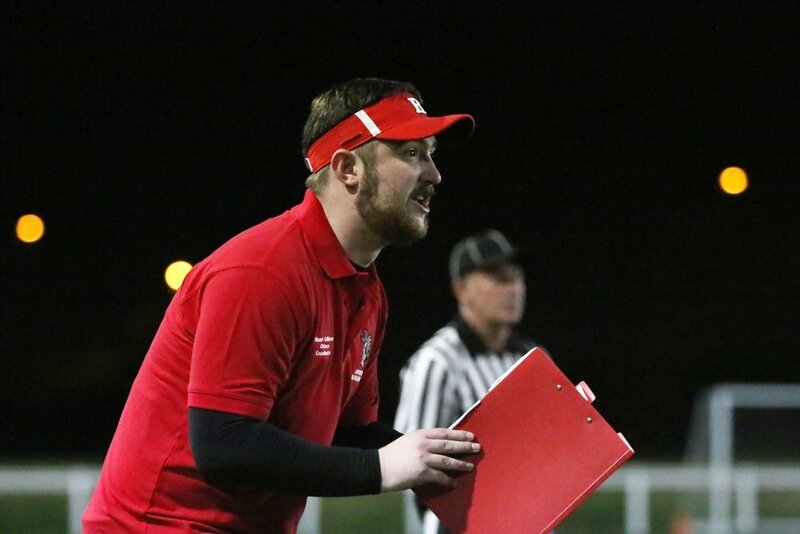 "The whole team came together and rallied well in the game to ensure Dumfries didn't level the game up in the third quarter when we were up by a score. We found ourselves backed up against the wall with Dumfries gaining momentum but from the Defensive point of view we made some huge plays in crucial moments to extend the lead and also turned the ball over in advantageous field position. We focus on the West Coast Trojans now, and look to improve our record to 6-0." Bud Light Game MVP: #22 DB/KR Gamu Mukuredzi: Gamu shut down one half of the field for the entire game, and his kick returns set us up in some excellent field position, and he got the Roughnecks' first ever return Touchdown. Well done Gamu, Dilly Dilly! Offensive MVP: #16 Chris Breen: Chris lead the offence up and down the field, likely had over 300 yards passing, and threw 4 Touchdowns. We can't ask for much more out of our man under centre. 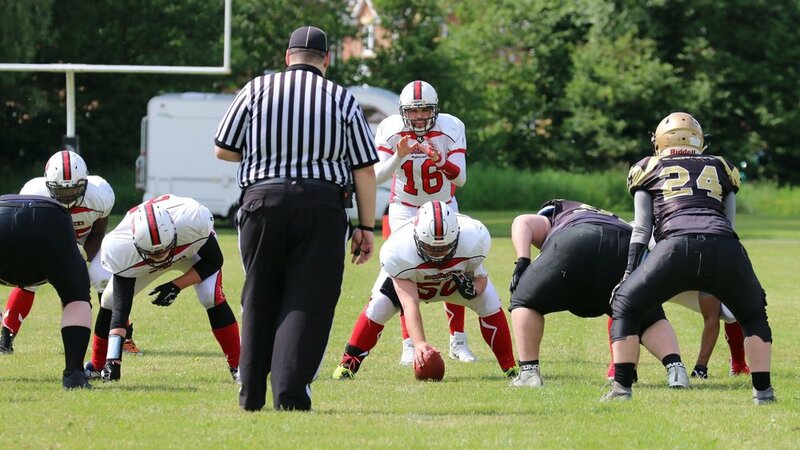 Defensive MVP: #85 Rob Hayes: Rob bossed the middle of the defence all game long; Worked hard to slow the Dumfries running game on every snap of the ball, hit hard and lead the defence in and out of the huddle. On a glorious day in Dumfries, the Roughnecks took to the field looking to get to 3 - 0 for the first time in our history but would face some stern opposition in the shape of the Hunters. Winning the toss at the David Keswick Athletic Centre the Roughnecks opted to receive the opening kick-off and get to work on offence. Following a couple of punts and a turnover, the Roughnecks would break the deadlock with a touchdown from RB #35 Dave Obatolu, who would power in from close range in the battle for supremacy in the NFC 2 North. The Roughnecks defence would hold strong with Linebackers #23 Phil McCall & #92 Daire O'Beirne recovering fumbles in the first half and Safety #20 Darren Henderson getting a turnover of his own with an interception which would benefit kicker #4 Stuart Don who added 3 points with a field goal from 30 yards out. Late in the half Quarterback #16 Chris Breen would find WR #6 Lewis Hughes 25 yards downfield who would juke past a defender and take it the rest of the way, making the score 17 - 0 at the half, with the successful PAT tacked on. Dumfries would come out with some adjustments in the second half and despite the defence's resolve so far this season, the plane of the endzone would finally be broken by an opposition offence as a long drive mainly on the ground resulted in a touchdown for the Hunters through the air. Determined not to let the Hunters back into the game Dave Obatolu would take the ball from inside his own half on the first play from scrimmage following the Hunters' score all the way to the house, making it 23 - 7 as the Roughnecks couldn't equal the Hunters' successful PAT. With their tails up the Hunters would score again through the air, whilst the Roughnecks added a field goal to make it a twelve point game at 26 - 14. The Roughnecks unable to add more points would punt the ball back to the Hunters with 4 minutes left in the game to potentially set up a tense finish. The Hunters would drive down the field to make it a one score game, but time would expire as they scored on the last play of the game, leaving the score as 26 - 20, and the Roughnecks 3 & 0 atop the division. "Very proud of the team going 3-0 for the first time in Roughnecks history. We dominated the first half and thoroughly deserved our 17-0 lead at the half. Credit to the Hunters they adjusted and came back hard in the second half and made it a lot closer than it should have been. I felt we left a lot of points on the field however and the offence did a good job moving the ball and scoring when we needed to. Im very pleased with the team so far this season and I'm very encouraged by the fact we are still a long way from our ceiling. If this team keeps progressing and fulfils it's talent, we can be one of the best teams in Div 2 by the end of the season." Bud Light MVP: Dave Obatolu - Dave ran hard all afternoon and scored two touchdowns to take the inaugural Bud Light MVP award. He left an array of Hunters in his wake as he thundered downfield. Offensive MVP: Lewis Hughes - Made a big impression in the passing game, making his way downfield on a number of passes, adding a long touchdown, and also setting up the offence in good field position on kick-off returns. Defensive MVP: Rob Hayes - Rob played every down today and did a terrific job stopping the run and leading the defensive unit, making crucial adjustments to ensure the victory. On a day where a broken down bus delayed kick-off, the Roughnecks arrived late to Garscube and set to work. Losing the toss, we elected to receive the ball, and set to work on offence, looking to get up early and kill off the game early. Receiver #1 Sean Breen would score his first ever Roughnecks touchdown in the second quarter, catching the ball in the back corner of the endzone after a nice lofty pass from QB #16 Chris Breen before Running Back #44 Grant Travis would add the 2 point conversion to make it 11 - 0. The Roughnecks defence would continue to hold strong, forcing multiple turnovers throughout the game. Another offensive drive would stall inside field goal range, and #4 Stuart Don would nail a 42 yard field goal which would've been good from 50 to make it 14-0 at the end of the half. Alleged worry for the facility's closing time would lead to 12 minute quarters and a running clock for the whole second half. The Roughnecks would continue to dominate the game and only add to the score, with the game finishing 27 - 0. Running Back #25 Diego Esquer would score his first touchdown for the Roughnecks in a game where he ran the ball hard alongside #35 Dave Obatolu in the backfield all day. It was a special day for Wide Receiver #18 Rhys Elmslie who would get his first touchdown since returning from his horrific leg break which saw him miss the entirety of the 2017 season on a long pass down the right side of the field once again from QB #16 Chris Breen. The PAT would be added to the first of these two, with the Trojans getting an arm up to block the second PAT and another field goal attempt in the second half to prevent any more scoring. "Despite WCT's limited numbers they came to play and made it tough for us in the first half. The offence moved the ball well at times but just lacked that finishing edge at certain points. Having said that still very encouraging signs and a lot of improvements to be made throughout the season as we can only get better. The line has been a standout unit already this season and are key to our success and I have full confidence in them kicking on and improving every game. 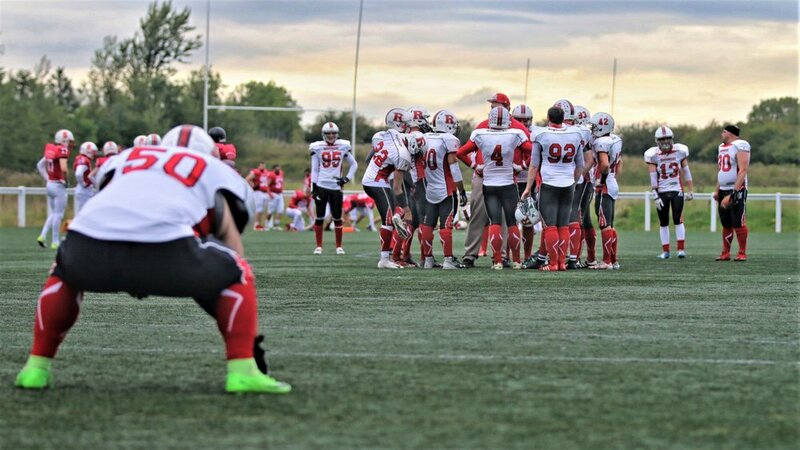 I think it is testament to where we have come as a team and the expectations we have this season that we are slightly disappointed with a 27-0 win as we know we missed some opportunities on offence. Once again the defence played lights out and will continue to be throughout the season." "Firstly I'd like to commend the players on another defensive shut out, only allowing one first down all day. The message throughout the week has been very much about getting on top and staying on top. This was something that we realised had to be carried out for us to come away with a victory. Now we've started the season 2 and 0 and are firmly looking forward to our next match up against the Dumfries Hunters and expecting the same attitude to be taken into that game as we have entered our first two with. A lot of respect should be given to the Trojans who battled all game long, being physical on every down despite severely lacking in numbers. They showed real character to keep going all day long." MVP: Josh Bahru - Outstanding effort and hard-work all game, getting downfield at every opportunity and setting the tone. 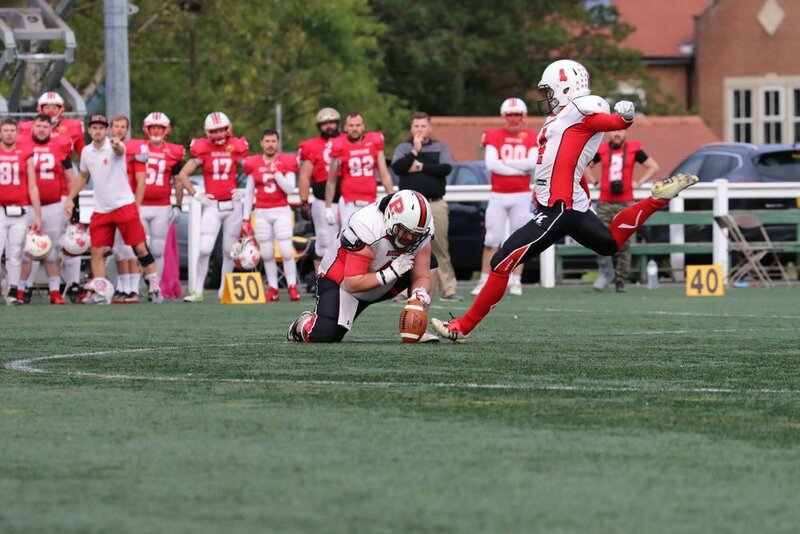 OMVP: Andy Watts - Similar to Josh above, Andy had a great game on the line, dominating his man on every down. DMVP: Che Mueller - Playing in his first ever game Che disrupted the Trojans centre all day leading to plenty of fumbles and even recovering one of his own. 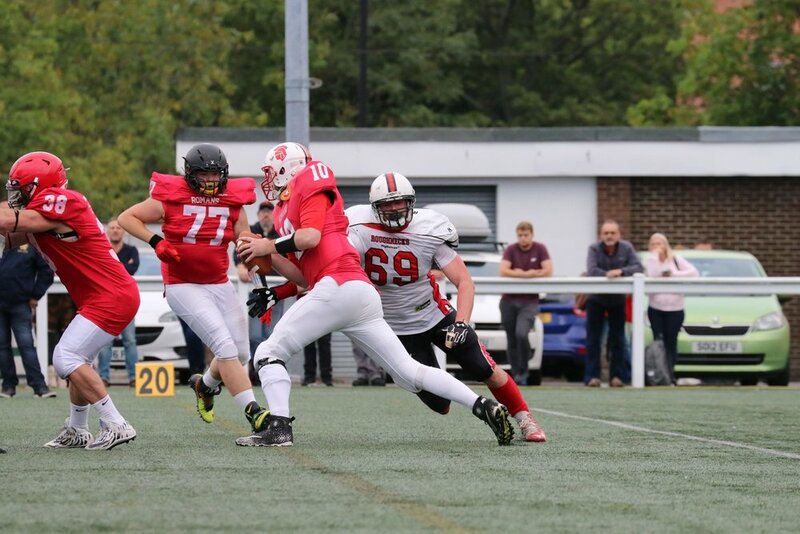 With the stage set for the start of our fifth BAFA National Leagues season, the Roughnecks were looking to get off the mark quickly with the visit of the Clyde Valley Blackhawks to The Rig. Winning the toss and choosing to defer, the Roughnecks were to take kick-off - on what was a great day for football despite the wind blowing down the pitch - and start on defence. Keen to hit the ground running, the Roughnecks defence were quick to get off the field on the first drive, and that was a theme they kept up all day, earning 9 total takeaways on the day, with 6 interceptions to three different recipients, and 3 fumble recoveries. Following a couple of drives that resulted in punts, the offence would find the endzone in the first quarter through Running Back #35 Dave Obatolu, who carried the ball up the middle and into the endzone from about 4 yards out. The extra point would be tacked on as the Roughnecks took a 7 - 0 lead. With the defence holding out, the offence would again get into scoring range before being stopped by the Blackhawks defence at the 9 yard line. Kicker, #4 Stuart Don would make the 26 yard field goal albeit in an unorthodox manner, as the ball bounced off of the top of the crossbar on the way through, no doubt giving Special Teams Co-ordinator George Pirie a small heart-attack, but making the score 10 - 0 nonetheless. Both defence and offence would continue to perform well, with the offence managing to put together a quick drive to again get into scoring range but the Blackhawks did well to block the resulting field goal as time expired on the first half. The second half would play out in a similar fashion as the first, with the defence holding steady, whilst the offence chipped away at the yardage down the field, however penalties - on both sides of the ball - would hamper the efforts early. The first score of the second half would come in the 4th quarter from the defence however. Following an offensive drive which stopped just over the halfway line, and the ensuing Roughnecks punt pinned the Blackhawks back on their own 1 yard line, and following two pass attempts on first and second down which went incomplete, the Roughnecks front 7 got to the CVB quarterback in the back of the endzone for the safety. 12 - 0 to the Roughnecks. Running Back #35 Dave Obatolu would find the endzone again on the right side from 22 yards out before Full Back #44 Grant Travis would stroll in with the 2 point conversion almost untouched to complete the Roughnecks scoring for the day; 20 - 0. 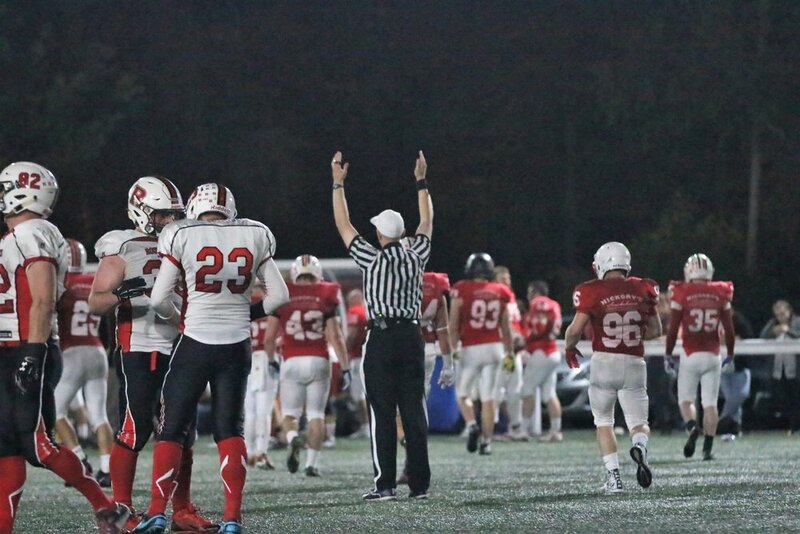 The Blackhawks would find the scoreboard themselves as their defence would recover a fumble and return it to the house, leaving the score at 20 - 6 as the extra point attempt hooked wide of the left upright. A great start to the season, beating the Blackhawks who themselves got off to a good start to the season last week, beating the Dumfries Hunters 13 - 12. A first competitive win for our new coaching staff at their first attempt speaks to their preseason programme and the hard work from the players, new and old to hit the ground running. 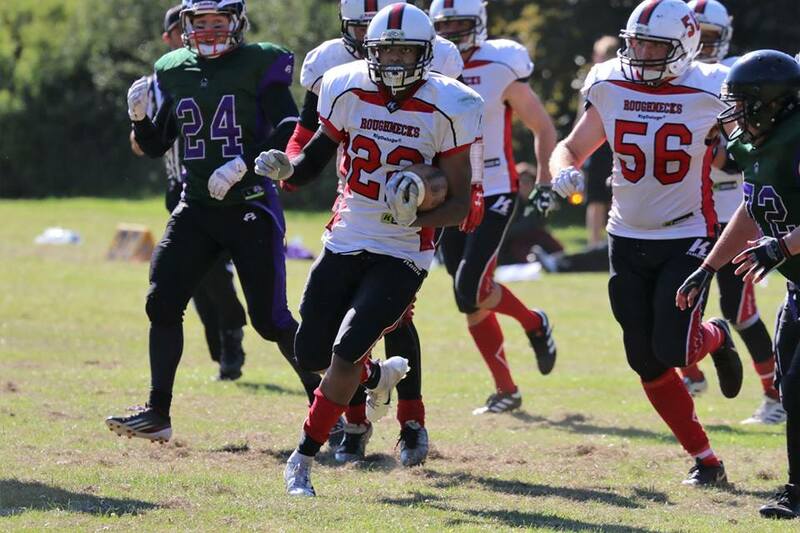 Special mentions go to Darren Henderson (who came away with four interceptions) and Andrew Watts (who recovered all three fumbles) on defence, David Obatolu (two touchdowns), and the whole offensive line who blocked well for the running backs and quarterbacks Chris Breen and Sean McDonald all day. A congratulations to all of our new rookies who made their first appearances for the team, playing vital roles and making plays across all three phases of the game. Worryingly however we did give away a lot of yardage in penalties, something that will need to be sorted down the line, but a good win to start the season, and encouraging signs on all three sides of the ball!